I initially made these QuickView charts for my own HTML-scripting reference due to the many technical variables involved in using fonts with the <FONT FACE> tag in Web pages. I've put them on the Web as a helpful guide showing what some of the font options are and how they display (when you have the font installed), providing HTML that works on supporting browsers and also giving links to developers from where you can obtain the highlighted fonts. When you have the fonts installed, the QuickViews become an invaluable aid to selecting a face that best fits the appearance you're aiming to achieve, plus appropriate alternates -- or so it's been for me, and my hope is that you will find it equally helpful for your needs. What makes them "web fonts"? Each typeface has a full family (normal, italic, italic bold, bold) and the face proportions are visibly easier to view at the standard (12 pt.) Web sizing. Additionally, the fonts have been optimized for screen use at least down to 8 pt. and are offered in both Windows and Macintosh formats. Another important element: they are being made available as freeware. !! August 14, 2002 - Microsoft Withdraws Free Web Fonts !! 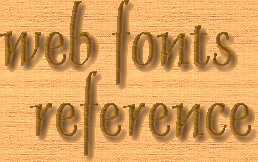 My own web fonts selection includes typefaces of full families, proportioned for the web and optimized for the screen, available for both Windows and Macintosh. I began making my own fonts for the web to increase the variety of page appearances. If you're looking for something beyond the usual serif and sans-serif, you'll find them here. offering several fonts in four general categories. The "Dreamers"category are especially multi-purposeful on the web. Some items to consider before you begin adding the <FONT FACE> tag to your pages for fonts that aren't designed for the web. How to add your fonts and alternates and what to look for if the font you've tried to add isn't displaying correctly in your browser checks. and is Copyright ©2006 by Varian.